This is a preliminary result of the network of retweets with the hashtag #jan25 at February 11 2011, at the time of the announcement of Mubarak’s resignation. If you retweeted someone, or has been retweeted, it is possible that your username is one of these tinny points (or maybe a bigger one?). To collect the network data, I used the Gephi Graph Streaming plugin, connected it to a Python web server I made myself. This web server works like a bridge, it connects to the Twitter Streaming API using the statuses/filter service and converts the users and retweets to nodes and edges in a network format that can be read by the Gephi Graph Streaming plugin. Nodes are twitter users, and links appear between the nodes A and B when B retweeted a message of A containing the hashtag #jan25. The static network visualization is just the final result of about one hour of data collection. It is a dynamic network, and it’s possible to get much more information from the collected data. For example, before the announcement, there were few nodes and edges, sparse in time. But when the announcement arrives, a boom of retweets appears on the network. A video with the flow of retweets is available on YouTube. It shows the dynamic network construction during the hour of data collection, compacted in less than four minutes. During the collection, I run Gephi with the Force Atlas layout just adjusting some parameters from default: repulsion strength to 2000, attraction strength to 0.3 and speed to 10. I was very lucky to get this data. On February 11 afternoon I was testing the Python server that works as bridge and connected to Twitter. I tried some interesting hashtags to see it working, and at the moment #jan25 seemed to be an active hashtag. I let the application run for some time, adjusted some parameters for visualization, and at some point there was a burst in the activity. I didn’t understood what was happening until I checked again my Twitter account and realized that the Egypt’s vice-president had just made the resignation announcement. After it, I proceeded collecting data, and the final result was this network. It was very interesting to see, in real time, the exact moment when Tahrir Square, from a mass protest demonstration, has been transformed in a giant party, and the burst in the Twitter’s activity. It was like covering in real time a virtual event, a big event that was happening in the Twitter virtual world. After playing with the data, I found that the data I got through the Twitter Streaming API is only approximately 10% of the total. I’m now working to recover all data and hopeful soon I can make available the full graph of retweets. Dataset available in a GEXF file here. Download it and play with it with Gephi! This work is part of a research project involving the Computer Science Department of the University of Turin (www.di.unito.it), the Complex Networks and Systems Group of the ISI Foundation (www.isi.it), and the Informatics department of Indiana University (http://cnets.indiana.edu/). A new force-directed layout algorithm plugin named OpenOrd has just been released. It is one of the few force-directed layout algorithms that can scale to over 1 million nodes, making it ideal for large graphs. Install it directly from Gephi (Tools > Plugins > Available Plugins) or download it from the Plugin Center. Longer description and source code can be found directly on the plug-in page. Below is a small demo of how fast this algorithm is layouting a 10K nodes network, and only using one processor. OpenOrd Layout Demo in Gephi from gephi on Vimeo. The algorithm original design and implementation can be found at this address. Kudos to the authors! A new plugin is available for Gephi that utilizes the power of natural language processing (NLP) software to analyze text documents and visualize their contents. The plug-in was created by AlchemyAPI (alchemyapi.com), and utilizes the AlchemyAPI REST service to semantically process a web page or text file and show all the subjects of the text (people, places and things, known collectively as named entities) as nodes in Gephi. Graph of the American Revolution wikipedia entry. The plug-in is a powerful tool to distill dense and unstructured textual data into easy to understand graphs. Extracted entities possess a relevance attribute which is a measure of how pertinent the subject is to the source text, and also a count attribute that indicates the number of times the subject is named in the source text. Both of these attributes can be used to affect the visualization. Once installed, the plug-in can be accessed through the File->Generate->Semantic Analysis menu. As an example of the functionality of the plug-in, we’ll examine the wikipedia entry for the American Revolution. To make a graph with this article, enter the article’s url into the Semantic Analysis dialog box. The plug-in will extract over 350 people, places, and things from the wikipedia page. You can use this data to create a word cloud type visualization of the article, like the one above. If subtype analysis is enabled, you can also visualize the types and subtypes of named entities. For example, the nodes in the image below were extracted from a recent news article. They represent Dmitry Medvedev and his ontological classifications. The edges from Medvedev’s node identify him as a Person, Politician, and President (classifications he shares with Mahmoud Ahmadinejad). A complete list of the subtypes AlchemyAPI returns can be found at http://www.alchemyapi.com/api/entity/types.html. The plug-in can also be used to visualize the connections between multiple text documents. Connections will be drawn between the document node and the entities that the texts share, creating a powerful way of discovering recurring themes within an archive. As an example, see the connections shared between the wikipedia pages for the American Revolution and the French Revolution in the picture below. Common entities like ‘France’, ‘Britain’, and ‘Thomas Paine’ are linked by both the French Revolution and American Revolution articles. Graph of connections between American and French Revolution wikipedia entries. As more documents are added to the graph, a web of entities form. The relevance and count of connected entities increase with the number of documents that mention them. We hope you use this plug-in to make the data in your text more accessible. If you have any questions or suggestions for the makers of this plug-in, please leave them in the comments section. Our thanks to the Gephi team for their remarkable visualization program, and all the documentation and help that made this plug-in possible. Graph of espn.com front page and linked articles. Download the Gephi plugin for AlchemyAPI here, or find it in your Gephi plug-in center. The project takes another big step forward and bring dynamic graph exploration on the web in one click from Gephi with the Seadragon Web Export plugin. Go to your Gephi installation and then to the Plugin Center (Tools > Plugin) to install the plugin. You can also download manually the plugin archive or get the source code. Communication about (large) graphs is currently limited because it’s not easy to put them on the web. Graph visualization has very much same aims as other types of visualization and need powerful web support. It’s a long time we are thinking about the best way to do this and found that there is no perfect solution. We need in the same time efficiency, interactivity and portability. The simpleness of making and hacking the system is also important, as we want developers to be able to improve it easily. By comparing technologies we found that Seadragon is the best short-term solution, with minimum efforts and maximum results. It has however still a serious limitation: interactivity. No search and no click on nodes are possible for the moment. But as it is JS, I don’t see hurdles to add these features in the future, help needed. The table below see our conclusions on technologies we are considering. We are very much eager to discuss it on the forum. As performance is the most important demand, WebGL is a serious candidate but development would require time and resources. We plan to start a WebGL visualization engine prototype next summer, for Google Summer of Code 2011, but we would like to discuss specifications with anyone interested and make this together. Figure: Comparing technologies able to display networks on the web. Install the plugin from Gephi, “Tools > Plugin” and find Seadragon Web Export. After restarting Gephi, the plugin is installed in the export menu. Load a sample network and try the plugin. Go to the Preview tab to configure the rendering settings like colors, labels and edges. The settings asks for a valid directory where to export the files and the size of the canvas. Bigger is the canvas, more you can zoom in, but it takes longer time to generate and to load. Note that result on the local hard-drive can’t be viewed with Chrome, due to a bug. Run Chrome with “–allow-file-access-from-files” option to make it work. Kudos to Microsoft Live Labs for this great library, released in Ms-PL open source license. Thank you to Franck Cuny for the CPAN Explorer project that inspired this plugin. Other interesting projects are GEXF Explorer, a Flash-based dynamic widget and gexf4js, load GEXF files into Protovis. The mixture between network and geographic data has a fantastic potential and didn’t completely reveals its power yet. Alexis Jacomy, a student member of the Gephi community just released a new Plugin named GeoLayout, which aims to bridge this gap. Congratulations! The Plugin use latitude/longitude coordinates to set correct nodes position on the network. Several projections are available, including Mercator which is used by Google Maps and other online services. The Plugin is available from Gephi Plugin Center. The author is looking for feedbacks, please visit the plugin page. I wanted to try with the classical USA Airline Routes network dataset, and detail the experience. In Gephi, go to the Tools menu and then Plugins. 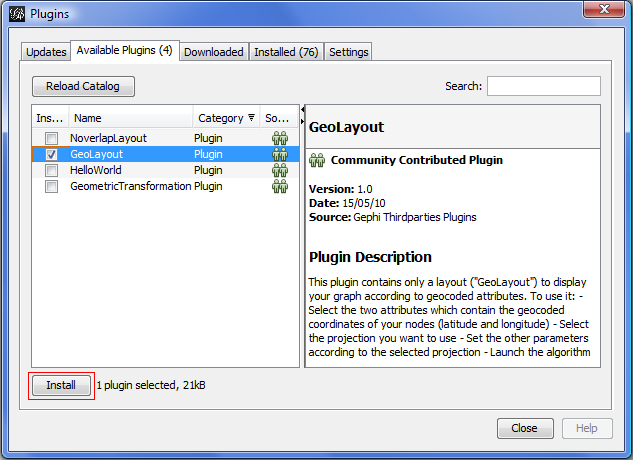 In the Available Plugins tab check the GeoLayout and click on Install. The plugin is installed and you are asked to reboot Gephi. 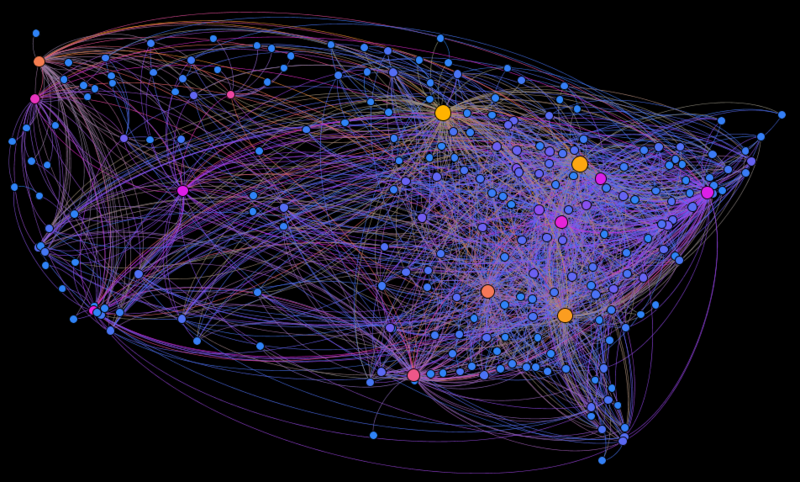 Click OK.
Download the airlines-sample.gexf (Save As…) dataset and open it with Gephi. The network is an undirected graph with 235 nodes and 1297 edges. For each node there are two additional data latitude and longitude, expressed in degrees. You should see the graph opened like this. Go to the Layout module and choose Geo Layout in the list. And then just click the Run button. You can see the result immediately. Analysis and aesthetics refinement can be done now. Please visit the Quick Start Tutorial for a step by step introduction to Gephi.